Army Boot Camp Embraces New-Age Fitness Young Army recruits reflect society at large: They're in terrible shape. So the top brass has revamped basic training to focus on core strengthening and mastering simple, precise movements. The mess hall fare has also been overhauled -- in place of deep-fried foods there are whole grains, low-fat yogurt and sliced fruit. 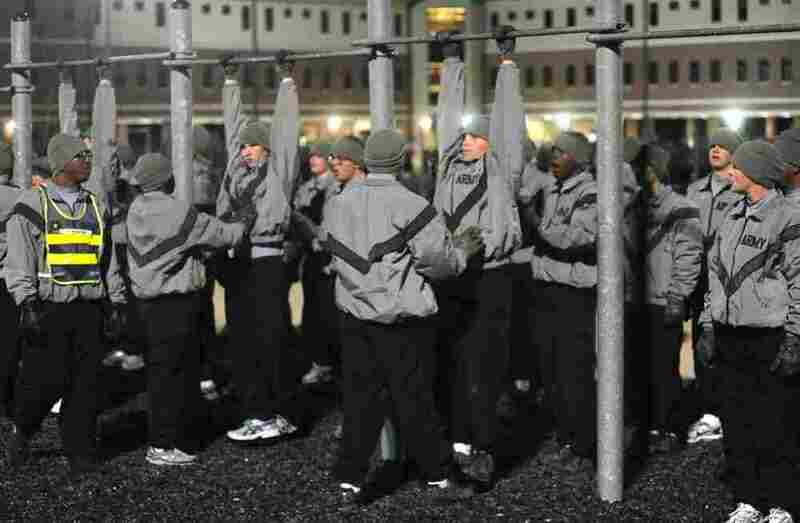 Bundled up against the cold, military police trainees exercise early in the morning at Fort Leonard Wood, Mo. In a radical shift, the Army is overhauling the way it trains, cares for and feeds new soldiers. During the past decade, the U.S. Army has faced what it regards as a serious internal threat: young recruits entering in terrible shape. In a radical shift, the Army is overhauling the way it trains, cares for and feeds new soldiers. So, as fad workouts increasingly borrow Army terms like "boot camp," actual basic training is starting to look a bit like a new-age fitness camp -- but with harsh words, severe haircuts and firearms. Just after 5 a.m. at Fort Leonard Wood, deep in the Missouri Ozarks, a breeze drops the wind chill into the teens as hundreds of Army recruits under floodlights drop to their mats for some low-impact cardio. It's the Army's largest basic training post, but it's a far cry from a Hollywood depiction of boot camp. Many of the freezing future soldiers, in gray sweats, caps and gloves, are struggling to do a few pull-ups. 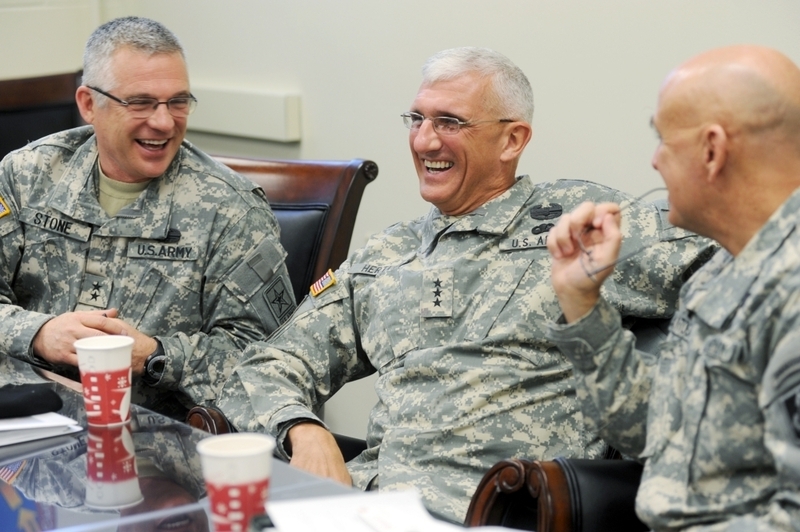 Army Deputy Surgeon General Maj. Gen. Richard Stone (from left), Lt. Gen. Mark Hertling and Maj. Gen. David Quantock laugh together at Fort Leonard Wood, Mo. Hertling, who is in charge of initial military training for the entire Army, says the Army's new core-strengthening exercises better prepare soldiers for battle. A decade ago, the Army started to notice that new recruits were, in general, getting weaker -- their endurance was down, so they were more prone to injury. "America's Army is very proud of the fact that we reflect our society," says Maj. Gen. Richard Stone, the Army's deputy surgeon general. "But since we reflect our society, we also absorb society's problems." "You'd be surprised, the soldiers that we get today," says Frank Palkoska, who directs the Army's fitness school. "They can't do simple motor function movements, like a shoulder roll, the ability to skip -- so we've got to lay a base of foundational fitness, without injuring them." Palkoska has completely revamped basic training at all posts, starting with, well, the basics: stretching and holding; mastering simple, precise movements. Soon, athletic trainers and physical therapists will join these workouts at Fort Leonard Wood to help soldiers avoid injuries and to quickly treat those that occur. You'd be surprised, the soldiers that we get today. They can't do simple motor function movements, like a shoulder roll, the ability to skip. Drill Sgt. Travis Bammer says old-school soldiers initially chafed at the change in training philosophy. "They would be resistant to it at first, because they'd think, 'Oh, well, it's a yoga, Jane Fonda workout,' " he says. "But if it's done correctly, within 30 minutes, that soldier will be worn out." "I saw a lot of folks saying that we had gone to yoga and Pilates," says Mark Hertling, the three-star general in charge of initial military training for the entire Army. "And I'm saying, 'Where the hell did they get that?' It's all about functional fitness, and using the body the way it might have to be used in a tactical situation." Hertling says the new core-strengthening exercises better prepare soldiers for battle -- to carry a wounded comrade, or to dart across a street, under fire, with 90 pounds of gear. But the Army has changed more than just the workout. "We've changed from just feeding soldiers to fueling the tactical athlete," Hertling says. 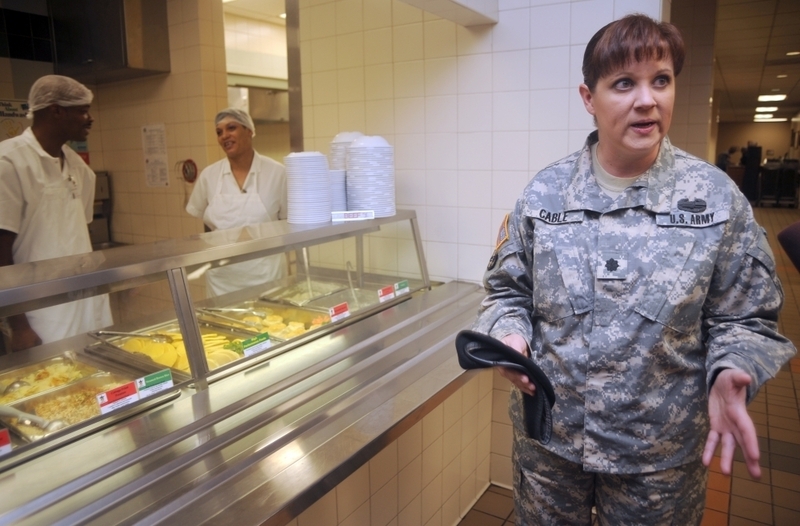 The Army ordered Lt. Col. Sonya Cable to review the food system. "I'm a good Southern girl," she says. "I grew up with biscuits and gravy, and my vegetables being cooked with bacon grease." But Cable is also a registered dietitian, and she was appalled by what the Army was serving young soldiers. Lt. Col. Sonya Cable helped design the Army's new nutrition program. Soon, at every basic training post, color-coded stickers will be used to rate every bit of the food. "Anything and everything -- it didn't matter about the calories; it didn't matter about the fat; it was, 'Let's feed 'em,' " she says. "And feed 'em what they think they like." In other words, french fries, burgers, deep-fried meat and soda. The Army was feeding recruits like an indulgent parent -- or rather an angry, controlling, indulgent parent. Army dining isn't a peaceful experience for new recruits. Stern drill sergeants antagonize new privates in the mess hall: "Hurry up!" "Grab your cup and let's go!" "Go that way!" "Let's go!" It's been this way for decades, but now, at Fort Leonard Wood, and soon, at every basic training post, color-coded stickers will be used to rate every bit of the food. There are still eggs, bacon and gravy, but all of the deep-fried stuff is gone, replaced by whole grains, low-fat yogurt and sliced fruit. It's a complete dietary reversal. Cable says the healthful food costs the same -- about $8 a day per recruit. And privates hustling through the line, guys like Edgar Puentes, say they like it, and that it's doing them good. "I dropped 35 pounds already, sir," Puentes says. He says he has lost that much weight over two months thanks to eating more fruits and vegetables and exercising in the morning. That's a big change for these recruits, many of whom were eating fast food daily before the Army. The question is, will the change hold? Once out of basic training, soldiers don't have to eat in the mess hall, and many don't. You'll see them at the fast-food joints that line roads just outside fort gates. The Army hopes that the fundamental changes in diet and exercise it's making will stick with these young soldiers -- and maybe spread to society at large. Because out-of-shape kids are a societal problem that's now becoming a military problem.